This dynamic and comprehensive text from nationally renowned scholars continues to demonstrate the profound influence African Americans have had -- and continue to have -- on American politics. Through the use of two interrelated themes -- the idea of universal freedom and the concept of minority-majority coalitions -- the text demonstrates how the presence of Africans in the United States affected the founding of the Republic and its political institutions and processes. 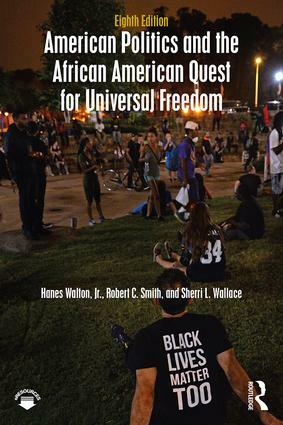 The authors show that through the quest for their own freedom in the United States, African Americans have universalized and expanded the freedoms of all Americans. A new co-author, Sherri L. Wallace, is renowned for her teaching, scholarship, and participation in APSA’s American government textbook assessment for coverage of race, ethnicity, and gender. She is the perfect addition following an election year that included female presidential candidates as well as candidates of color and issues focusing on racial tension and inequality. Offers a new Media Integration Guide for the first time. Provides the first overall assessment of the Obama administration in relation to domestic and foreign policy and racial politics in particular. Updated through the 2016 elections, connecting the Obama years with the new administration. Looks at candidates Hillary Clinton and Ben Carson in particular in relation to the themes of the book. Adds a new section on State Politics and Elections. Includes new sections on intersectionality dealing with issues of race, gender and sexuality; LGBT issues as another manifestation of the struggle for universal freedom; a discussion of the "Black Lives Matter" movement; and a new section focusing on the changing character of black ethnicity as result of increased immigration from Africa and the Caribbean. Discusses the way in which race contributed to the polarization of American politics; the connections to the Tea Party; and the Obama Presidency and the 2016 presidential campaign as the most polarized since the advent of polling. Previews the impact of the Trump Administration on matters of race and ethnicity.